A report last month by the National Infrastructure Commission set out a 1 in 4 chance over the next 30 years that large numbers of households and businesses will have water supplies cut off for an extended period of time. And it estimated the economic impact of severe restrictions in England at between £25 and £40 billion. The Waterwise Retailers Leadership Group for Water Efficiency will aim to support and encourage water retailers to aim higher on water efficiency in Year 2 of the market, building on practice to date – and to broker discussions with other key players on barriers and opportunities through invited slots (for example wholesalers, regulators, government and manufacturers). 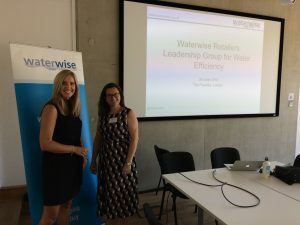 It will be a sister Group to ​Waterwise’s Leadership Group on Water Efficiency and Customer Participation for Chief Customer Officers of the UK wholesale water companies – an action of Waterwise’s Water Efficiency Strategy​. The group is co-chaired by Nicci Russell, Managing Director of Waterwise, and Jo Dow, CEO of Business Stream. 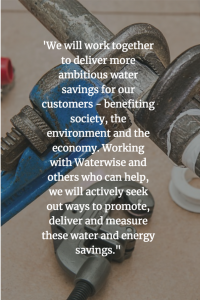 Jo Dow said “​As an industry we can achieve much more by working together to promote the importance of water efficiency and delivering environmental and financial benefits for our customers. The leadership group will provide the ideal platform for retailers to share ideas and best practice and, as someone who is very passionate about water efficiency, I’m delighted to be Co-Chairing the Group alongside Nicci Russell”. The first meeting explored the experience to date on water efficiency and opportunities for greater ambition in Year 2 of the market. This page will be updated with commitments and topics from meetings. Subscribe to our email newsletter for useful tips and valuable resources, sent out monthly. If you change your mind you can unsubscribe at any time. 29 Apr 2019 Events coming up - watch this space!